For purposes of the statistics and charts in this report, our database includes venture financing transactions in which Wilson Sonsini Goodrich & Rosati represented either the company or one or more of the investors. The consistently strong venture financings market in 2018 resulted in the highest yearly median pre-money valuations and amounts raised for equity rounds since WSGR started tracking this data in 2010. The most dramatic increase was for Series B median pre-money valuations, which reached a high of $73.5 million in full-year 2018—twice the median premoney valuation reported in full-year 2016 and well above the full-year 2017 median of $45.0 million. These strong pre-money valuations were accompanied by high median amounts raised across all equity rounds of financing in full-year 2018, with medians topping those of the prior four years. High pre-money valuations also boosted the percentage of up rounds to 84% of all Series B and later financings for full-year 2018. 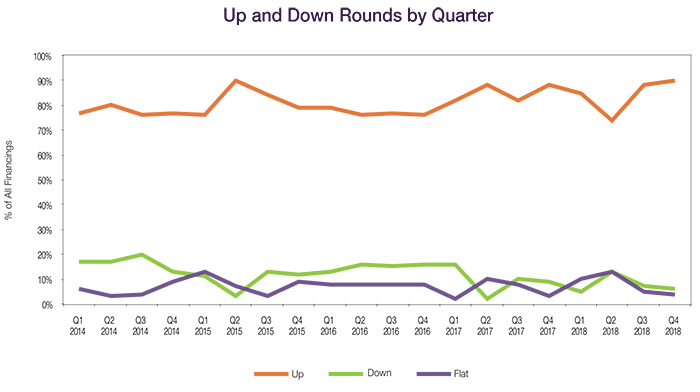 Up rounds represented 90% of all Series B and later financings in Q4 2018, a high not seen since Q2 2015. Up rounds represented 84% of all financings in fullyear 2018, nearly matching the 85% share of up rounds seen in full-year 2017. Down rounds in Q4 2018 decreased slightly to 6% of all deals from 7% in Q3 2018, while flat rounds saw a similar decrease, from 5% to 4%. For full-year 2018, down and flat rounds each represented 8% of financings. 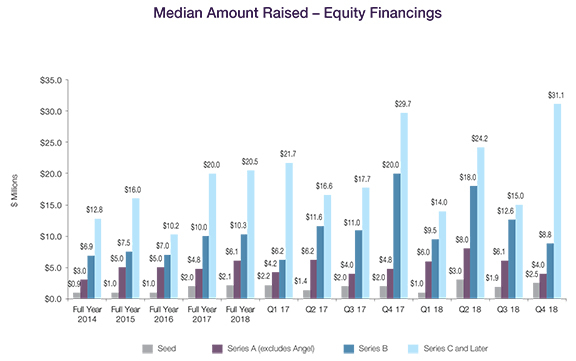 Median pre-money valuations for Series Seed financings inched down from $9.0 million in Q3 2018 to $8.7 million in Q4, while Series A valuations dipped from $21.0 million in Q3 to $18.5 million in Q4. However, the median pre-money valuations for early-stage rounds remained strong, with the full-year 2018 pre-money median valuations for Seed and Series A deals landing at $8.0 million and $20.0 million, respectively—the highest full-year median valuations of the last five years. 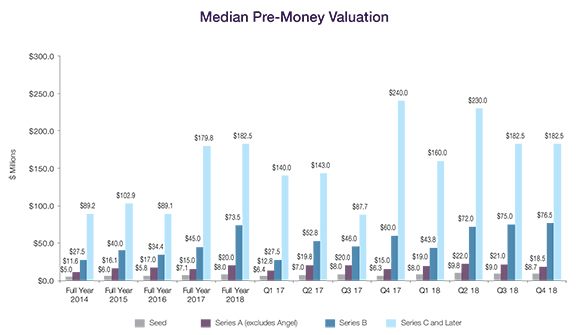 The median pre-money valuation for Series B rounds reached a high of $76.5 million in Q4 2018, up from $75.0 million in Q3. 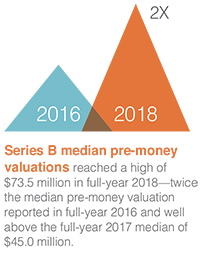 The full-year 2018 median pre-money valuation for Series B rounds also exceeded those of prior years, reaching $73.5 million—well above the five-year median of $41.3 million. Strong pre-money valuations throughout 2018 and an above-average number of unicorn deals led to a strong year for latestage financings. The Q4 2018 median pre-money valuation for Series C and later financings was $182.5 million, the same as Q3. The full-year 2018 median pre-money valuation for Series C and later financings more than doubled from that of full-year 2016, from $89.1 million to $182.5 million, well above the five-year median of $130.0 million. Full-year 2018 median amounts raised across all rounds of funding were the highest since WSGR started tracking this data in 2010. The median amount raised for Series Seed financings in Q4 2018 increased from $1.9 million in Q3 2018 to $2.5 million in Q4. The median amount raised for Series A financings slipped from $6.1 million in Q3 2018 to $4.0 million in Q4, but nonetheless ended full-year 2018 at $6.1 million, exceeding the median amount raised in each of the prior four years. The median amount raised in Q4 2018 Series B financings fell from $12.6 million in Q3 to $8.8 million in Q4. Even so, the fullyear 2018 Series B median amount raised was $10.3 million, well above the five-year median of $8.0 million and slightly above the full-year 2017 median of $10.0 million. The median amount raised in Series C and later transactions rose to $31.1 million in Q4 2018, representing the highest quarterly median of the past five years. The full-year 2018 median for Series C and later transactions was comparable to that of 2017, increasing slightly from $20.0 million in 2017 to $20.5 million in 2018, and outpacing the five-year median of $15.8 million. The use of senior liquidation preferences decreased modestly in Series B and later rounds, from 35% of all such rounds in 2017 to 31% in 2018. Senior liquidation preferences in up rounds dipped from 31% in 2017 to 28% in 2018, while their use in down rounds dropped significantly, from 63% in 2017 to 36% in 2018. Pari passu liquidation preferences in up rounds increased from 66% in 2017 to 72% in 2018, and also increased in down rounds, from 38% in 2017 to 64% in 2018. The percentage of financings having a liquidation preference with participation fell slightly across all financings, slipping from 16% in 2017 to 12% in 2018. The proportion of down rounds with participating liquidation preferences dropped dramatically from 50% in 2017 to 21% in 2018. Only 68% of financings had dividends in full year 2018, notably lower than the 85% figure for 2017. The use of broad-based weighted average anti-dilution protection remained steady at 94% of all deals in 2018. The same was true for narrow-based weighted average anti-dilution protection, which remained steady at 2%. The percent of deals having redemption rights decreased from 19% in 2017 to 9% in 2018, and fewer of those were mandatory, down from 7% of all deals in 2017 to 1% in 2018. Data on deal terms such as liquidation preferences, dividends, and others are set forth in the table below. To see how the terms tracked in the table can be used in the context of a financing, we encourage you to draft a term sheet using our automated Term Sheet Generator, which is available in the Emerging Companies section of the firm’s website at www.wsgr.com. 1 We based this analysis on deals having an initial closing in the period to ensure that the data clearly reflects current trends. Please note that the numbers do not always add up to 100% due to rounding. 2 Includes flat rounds and, unless otherwise indicated, Series A rounds. 3 Note that the All Rounds metrics include flat rounds and, in certain cases, Series A financings as well. Consequently, metrics in the All Rounds column may be outside the ranges bounded by the Up Rounds and Down Rounds columns, which will not include such transactions. 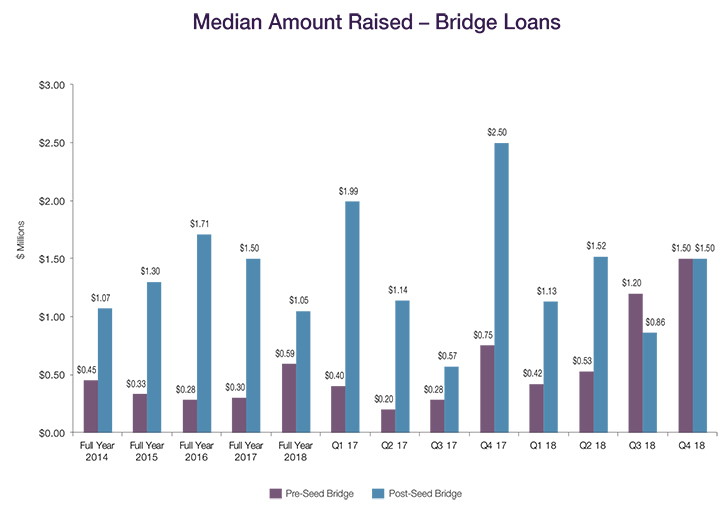 The median amount raised in pre-Seed bridge loans increased in Q4 2018, from $1.20 million in Q3 to $1.50 million in Q4. The full-year median amount raised was $0.59 million, nearly twice the $0.30 million median of 2017. The median amount raised for Q4 2018 post-Seed bridge loans rebounded from $0.86 million in Q3 to $1.50 million in Q4. However, at $1.05 million, the full-year 2018 median amount raised for post-Seed bridge loans marked the lowest median of the past five years. Bridge loan interest rates for pre-Seed deals increased in 2018. Among pre-Seed bridge loans, 33% had interest rates at 8% or greater, compared to 25% in 2017, while the number of pre-Seed bridge loans with interest rates less than 8% decreased to 67% in 2018, the lowest share in five years. In contrast, interest rates decreased for post-Seed bridge loans in 2018, with 65% of post-Seed bridge loans having an interest rate below 8%, compared to 56% in 2017. In addition, the percentage of loans with maturity periods of less than 12 months decreased for post-Seed financings, from 41% in 2017 to 21% in 2018, reflecting a trend toward longer term, lower-interest loans for more mature companies. More post-Seed loans were subordinated to other debt, increasing from 33% in 2017 to 47% in 2018. Of the 18% of postSeed bridge financings that had warrants in 2018, 45% also had a discount on conversion into equity, down significantly from 2017, when 60% of post-Seed bridge financings that had warrants also had a discount on conversion. The number of pre-Seed bridge loans that were convertible to equity at a discounted price decreased slightly from 89% in 2017 to 83% in 2018, and 77% of those were convertible at a discount rate of 20% or more on conversion. On the other hand, the number of post-Seed bridge loans that were convertible to equity at a discounted price increased from 76% in 2017 to 85% in 2018, with 81% of those receiving a discount rate of 20% or more on conversion. The 2018 median dollar thresholds for a qualified financing in pre- and post-Seed bridges were $3.0 million and $5.0 million, respectively, as compared to $2.0 million and $10.0 million, respectively, in 2017. The 2018 median conversion price caps in pre- and post-Seed bridges were $8.0 million and $40.0 million, respectively, as compared to $10.0 million and $25.0 million, respectively, in 2017. 1 We based this analysis on deals having an initial closing in the period to ensure that the data clearly reflects current trends. Please note the numbers do not always add up to 100% due to rounding. 2 Of the 2014 post-Seed bridges with warrants, 38% also had a discount on conversion into equity. Of the 2015 post-Seed bridges with warrants, 58% also had a discount on conversion into equity. Of the 2016 post-Seed bridges with warrants, 33% also had a discount on conversion into equity. Of the 2017 post-Seed bridges with warrants, 60% also had a discount on conversion into equity. Of the 2018 post-Seed bridges with warrants, 45% also had a discount on conversion into equity. 3 Of the 2016 pre-Seed convertible bridges, 93% had automatic conversion and 7% had voluntary conversion. Of the 2017 pre-Seed convertible bridges, 94% had automatic conversion and 6% had voluntary conversion. Of the 2018 pre-Seed convertible bridges, 98% had automatic conversion and 2% had voluntary conversion. Of the 2016 post-Seed convertible bridges, 97% had automatic conversion and 3% had voluntary conversion. Of the 2017 post-Seed convertible bridges, 93% had automatic conversion and 7% had voluntary conversion. Of the 2018 post-Seed convertible bridges, 96% had automatic conversion and 4% had voluntary conversion. The 2016 median dollar threshold for a qualified financing in pre- and post-Seed bridges was $1M and $5M, respectively. The 2017 median dollar threshold for a qualified financing in pre- and post-Seed bridges was $2M and $10M, respectively. The 2018 median dollar threshold for a qualified financing in pre- and post-Seed bridges were $3M and $5M, respectively. 4 The 2016 median price cap in pre- and post-Seed bridges was $6M and $25M, respectively. The 2017 median price cap in pre- and post-Seed bridges was $10M and $25M, respectively. The 2018 median price cap in pre- and post-Seed bridges was $8M and $40M, respectively. 5 Of the 2014 post-Seed bridges that had a discount on conversion into equity, 10% also had warrants. Of the 2015 post-Seed bridges that had a discount on conversion into equity, 21% also had warrants. Of the 2016 post-Seed bridges that had a discount on conversion into equity, 8% also had warrants. Of the 2017 post-Seed bridges that had a discount on conversion into equity, 13% also had warrants. Of the 2018 postSeed bridges that had a discount on conversion into equity, 11% also had warrants. The Up/Down/Flat analysis is based on WSGR deals having an initial closing in the period reported to ensure that the data clearly reflects current trends. The median pre-money valuation is calculated based on the pre-money valuation given at the time of the initial closing of the round. If the issuer has a closing in a subsequent quarter, the original pre-money valuation is used in the calculation of the median for that quarter as well. A substantial percentage of deals have multiple closings that span fiscal quarters. The median amount raised is calculated based on the aggregate amount raised in the reported quarter. This report is based on detailed deal data provided by the firm’s corporate and securities attorneys and analyzed by the firm's Knowledge Management department. This report is based on detailed deal data provided by the firm's corporate and securities attorneys and analyzed by the firm's Knowledge Management department. To learn more about WSGR's full suite of services for entrepreneurs and early-stage companies, please visit the Emerging Companies section of wsgr.com. For more information about this report or if you wish to be included on the email subscription list, please email us at EntrepreneursReport@wsgr.com. There is no subscription fee.